Last updated: Oct. 3, 2018; I will continue to add more events as I uncover them. The Halloween activities taking place at state park campgrounds are restricted to registered campers. These events are very popular, so reserve your site early. to 09/28/18 SW Ohio, Butler / Preble County Hueston Woods SP Halloween Campout: Campsite decorating, games, haunted trail & Halloween treats. For more information, call (513) 523-6347.
to 10/06/18 NW Ohio, Fulton County Harrison Lake Halloween Campout: Decorate your campsite, enjoy trick or treating and more! to 10/06/18 NW Ohio, Ottawa County East Harbor Halloween Campout: For campers only: Games, activities, giveaways, bonfires, hay rides, trick or treating and much more! to 10/06/18 Central Ohio, Delaware County Alum Creek Fall Festival: Family friendly activities Friday night and Saturday night enjoy the haunted trail located at the amphitheater. Saturday activities include pumpkin decorating contest, campsite judging, costume contest and much more. to 10/06/18 NE Ohio, Lorain County Findley Fall Campout: For campers only: on Fri. there is a hospitality hour, followed by a movie. On Sat. there are hay rides, trick-or-treat, a corn-hole tournament, and more. For more information, call (400) 647-5749, ext. 100 or ext. 102. 3 – 4:30pm NE Ohio, Akron area Firestone Trick Or Tweet: Bird watching while hiking, plus bird feeding. While you are at it, learn some “tricks” of the animal world. to 10/13/08 NW Ohio, Ottawa County East Harbor Halloween Campout: For campers only: Games, activities, giveaways, bonfires, hay rides, trick or treating and much more! to 10/13/18 NE Ohio, Jefferson County Guilford Lake Fall Campout: For campers only: Naturalist-lead games and activities for kids, movie, decorated campsites, trick-or-treating on Saturday night. to 10/13/18 NW Ohio, Fulton County Harrison Lake Halloween Campout: For campers: Decorate your campsite, trick or treating and more! to 10/13/18 NW Ohio, Shelby / Auglaize County Lake Loramie Halloween Campout: For campers only: movie, kids crafts and games, chili cook off, noon pot luck, and trick-or-treat. to 10/13/18 SE Ohio, Ross County Paint Creek Halloween Campout: Come and enjoy the autumn colors surrounding the park along with fun-filled Halloween activities including campsite decorating, costume judging, pumpkin contest and trick-or-treat. to 10/13/18 SE Ohio, Scioto County Shawnee SP Halloween Campout: Pumpkin-carving contest, trick-or-treating & costume parade. to 10/21/18 Central Ohio, Delaware County Columbus Zoo & Aquarium Boo at the Zoo: Wear your costume to the zoo (adults must have uncovered faces). Treat stations, hay maze, hay rides, hundreds of carved pumpkins, Marvel superheroes in costume, and more! 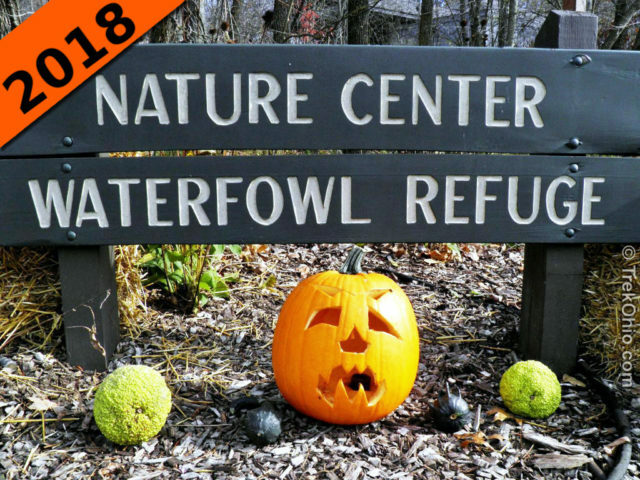 to 10/20/18 NE Ohio, Columbiana County Beaver Creek SP Halloween Campout: Potluck supper, naturalist-lead events, decorated campsite contest, costume contest, trick-or-treating. 10/19/18 NE Ohio, Richland County Malabar Farm Haunting at the Harvest: Guests will experience a haunted hayride & hike around the harvest fields of Malabar. Families can also find fun fall activities! $3 per person & concession is available. to 10/20/18 SW Ohio, Clermont County East Fork Not-Quite Halloween Campout: Activities for registered campers only. to 10/20/18 SW Ohio, Highland County Rocky Fork Halloween Campout: Enjoy the changing leaves and many fun-filled activities, including kid‘s games, pumpkin hunt, pumpkin carving, campsite decorating, costume judging and trick-or-treat! 6:30 – 8pm NE Ohio, Akron area F. A. Seiberling Nature Realm Not-So-Spooky Stories & Campfire: Sit around the campfire, enjoy marshmallows and listen to night-time tales. Meet at the Campfire Area. 10/20/18 NW Ohio, Logan County Indian Lake Halloween Campout: For campers only: movies (popcorn and cider will be served by camp ghosts), golf cart parade, trick-or-treating. Contests include: pumpkin carving, human costume judging, pet costume judging, campsite decorating. 10/21/18 NE Ohio, Richland County Malabar Farm Haunting at the Harvest: Guests will experience a haunted hayride & hike around the harvest fields of Malabar. Families can also find fun fall activities! $3 per person & concession is available. 6:30 – 7:30pm NE Ohio, Akron area Firestone Pumpkin Carving: Bring Your Own Pumpkin, or register to receive a free pumpkin while supplies last (limit one per family, registration begins Oct. 13). Some carving utensils will be provided. For more info, call (330) 865-8065. Meet at Coventry Oaks. to 10/28/18 Central Ohio, Delaware County Columbus Zoo & Aquarium Boo at the Zoo: Wear your costume to the zoo (adults must have uncovered faces). Treat stations, hay maze, hay rides, hundreds of carved pumpkins, Marvel superheroes in costume, and more! to 10/27/18 Central Ohio, Pickaway County Deer Creek SP Halloween Weekend: Campsite decoration contest, fish fry, pumpkin pie eating contest, pumpkin carving/painting contest, old fashioned beans and cornbread, trick-or-treat, hayrides, door prizes, 50/50 fundraiser, food sales served by the Friends of Deer Creek, craft vendors. to 10/27/18 SE Ohio, Muskingum County Dillon Halloween Campout: Event includes costume contest, site decorating contest, pumpkin decorating, trick-or-treating and much more! 10/27/18 SE Ohio, Guernsey County Salt Fork Halloween Party: Games, trick-or-treating, a hayride, and other Halloween festivities. 6:30 – 8pm NE Ohio, Akron area Munroe Falls Haunted History Hike: Learn the haunted and not-so-haunted history of the Tallmadge Meadows area of Munroe Falls Metro Park while hiking along the Meadow Trail with a naturalist. 7 – 8:30pm NE Ohio, Akron area Deep Lock Quarry Eerie Ohio Hike: Rediscover a more menacing Ohio under the cover of darkness with a naturalist. Learn that there’s nothing to fear! Bring bug repellent. Share the post "Halloween Events at Ohio Parks for 2018"